The challenge to grow all the vegetables for our Christmas dinner has been uppermost in Ade’s thoughts for months. He managed it last year and he’s been nurturing the winter veg at the allotment since late summer, keen to repeat last year’s success. 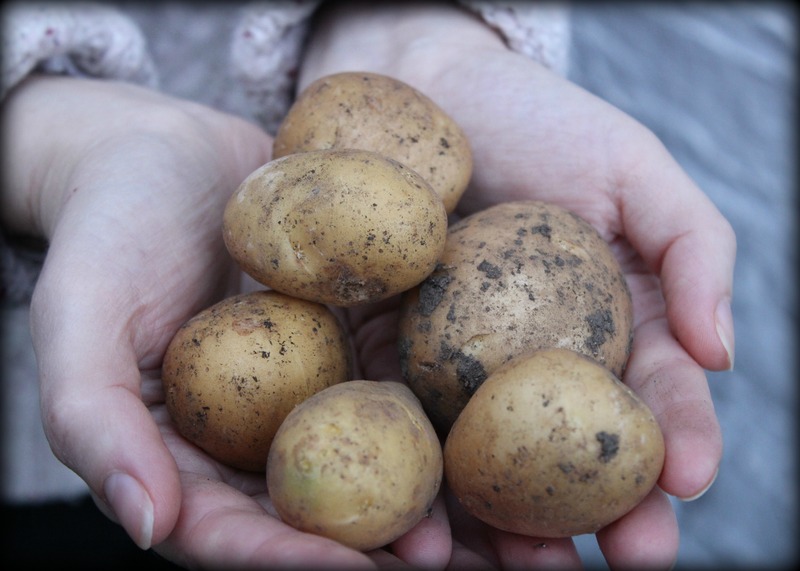 However, at the start of October, potato blight wrecked our spuds and Ade was forced to dig up the infected plants. He managed to rescue some of the crop, and the potatoes he saved were fine to eat at the time, if a little on the small side. So we resigned ourselves to the fact our Christmas lunch wouldn’t be entirely homegrown this year. It looked like we were on track for everything else: the swede, broccoli, cabbage, sprouts, onions, carrots and parsnips were all coming along nicely, but we knew we’d have to do a last minute shop for potatoes before the big day. I was rifling through a rather untidy corner of our kitchen earlier in the week when I came across a bag. At the bottom of the bag, I discovered a small handful of potatoes; the last of the potatoes Ade had been forced to dig up in early October. There aren’t many of them, but with so many other veggies on our Christmas menu, we shouldn’t need many. It’s amazing they didn’t sprout, having been stuck in a plastic bag in a humid corner of the kitchen for all this time! So it looks like we’ll have a fully homegrown Christmas dinner this year after all. Yay!!!! A Christmas miracle, indeed. Happy holidays to you and yours! A little gift to yourselves! Merry Christmas!